"Lapis Trio is an acoustic group featuring the compositions of jazz guitarist Casey Nielsen. 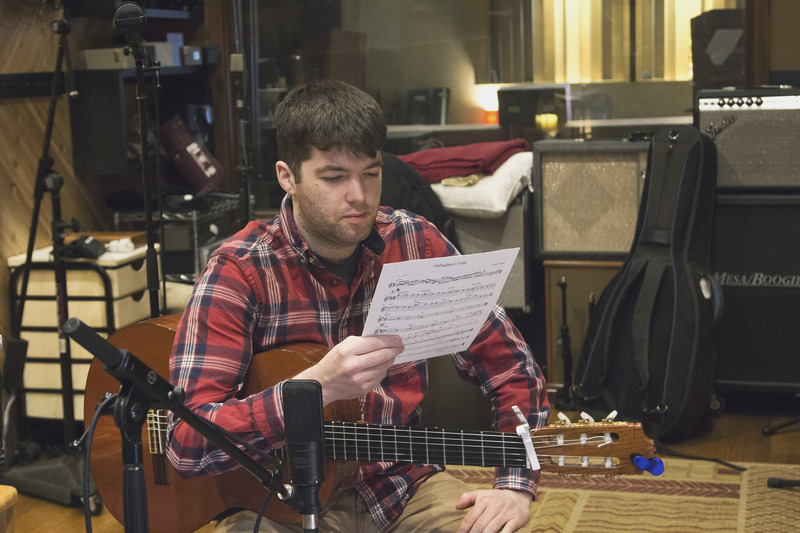 Casey's music draws on his study of the classical guitar and modern jazz. Casey will be joined by Dan Thatcher on upright bass and Tim Mulvenna on percussion." The Travelers began as a compositional device that allowed Casey Nielsen to frame this entire project. He imagined what he might write if he only had one day to write it, if he were to perform this piece that very same evening for the rest of his community upon their return from work. What if his role in this community was that he had to perform a new piece every night? Every piece would need to immediately engage the audience, by being unique and entertaining. The music, like the returning community members, would need to travel in some sense and then come home. And so he traveled, wrote, performed and returned home, repeating this inspirational cycle many times. The device got me started but perfecting each piece also required far more time than one day. Actually, The Travelers is quite difficult and poses unique challenges. Like the cannon of the classical guitar, the music on this album draws from many musical traditions and Casey needed to enlist a bassist and percussionist who were not only great jazz improvisers but musicians who were excellent readers and comfortable playing a variety of styles and complicated rhythms. Percussionist Tim Mulvenna has traveled extensively with jazz, Irish and Middle Eastern ensembles. Bassist Dan Thatcher’s soft tone, compositional sensibility and versatility are what make him a very active bassist on the Chicago jazz scene and both were a great fit for The Travelers. They became the Lapis Trio. But even with proficient musicians, it took time for the ensemble to gain an easy and accurate hold of the music. The Lapis Trio worked together, perfecting our performance of the music around the Midwest for the past 2 years and was ready to record. Casey’s brother, Dana Nielsen, flew in from California to record The Travelers with Lapis Trio at Shirk Studios. It was important to capture our instruments’ innate qualities in our acoustic group, and Dana’s deft hand at mic’ing and his experience recording acoustic artists such as Bob Dylan, Neil Young and the Avett Brothers made our sessions productive and inspired. His work on this CD is masterful.